Minimal Header view for those who don't want the "Turbine Vault" look. If you are an altaholic like me, you have spent countless hours logging characters in and out looking for where you put crafting supplies or trophies. 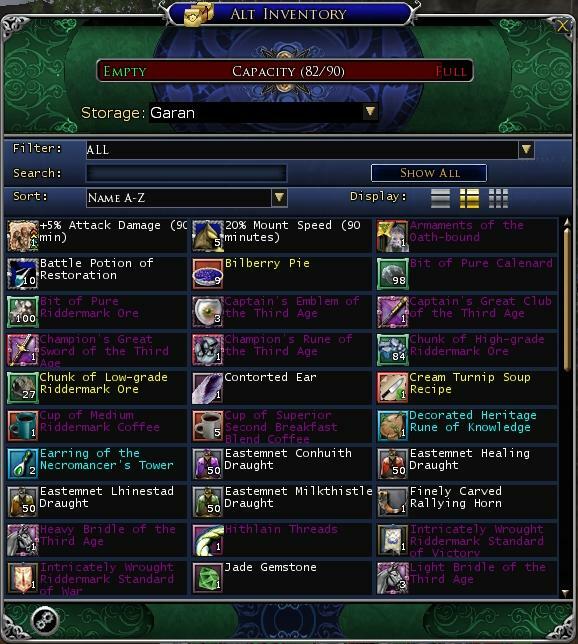 Alt Inventory allows you to view a snapshot of your alt's bag inventory, vault and shared storage without leaving game so that you know which character has how many of which items. NOTE: THIS AND ALL OTHER INVENTORY PLUGINS ONLY HAVE ACCESS TO BAGS, EQUIPPED ITEMS, VAULT AND SHARED STORAGE CURRENTLY. There is no access to Housing Storage or Wardrobe. As soon as Turbine grants Lua plugins access to any other form of storage I and most other developers will add that to our plugins. Finally, the long awaited version 3.0 update has arrived. 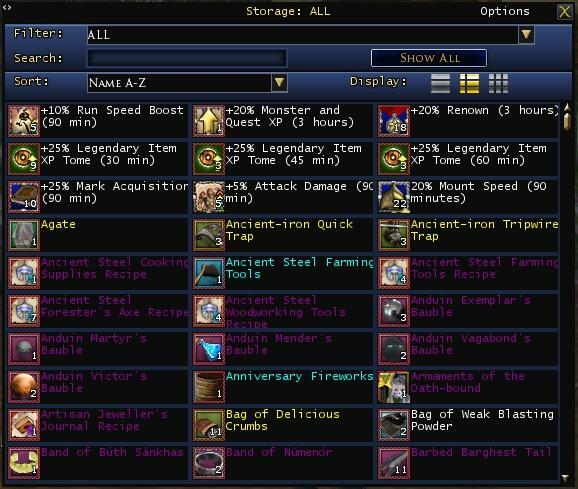 Alt Inventory allows you to quickly and easily view all of your inventory for your character, your alts, all vaults, and shared storage in one view. You can filter the display by item category or enter a case-insensitive search (accent-insensitive as well so this works for DE and FR clients as well!) for an item by name. You can sort the view by Name, reverse Name, Category or Quality. You can also choose to display icons and text, text only or icons only. The window is resizable and movable, will disappear for clean screenshots and can be opened from an icon when desired or by the chat command "/altinventory show". Version 3.0 now focuses only on inventory display. 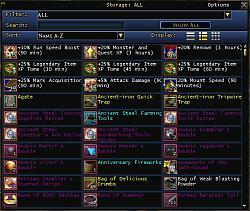 The Item Tracking features are now a separate plugin, ItemTracker and all non-inventory displays will be in AltViewer. This separation of functionality allows the plugin to function far more efficiently as well as allowing all of the inventories to be merged into a single display. 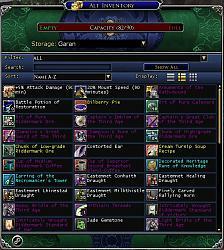 Quantity details can be viewed by hovering over the name of the item. 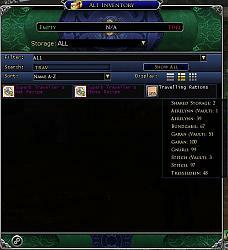 In the "ALL" view, this will display how many of the item are in each type of storage by character. 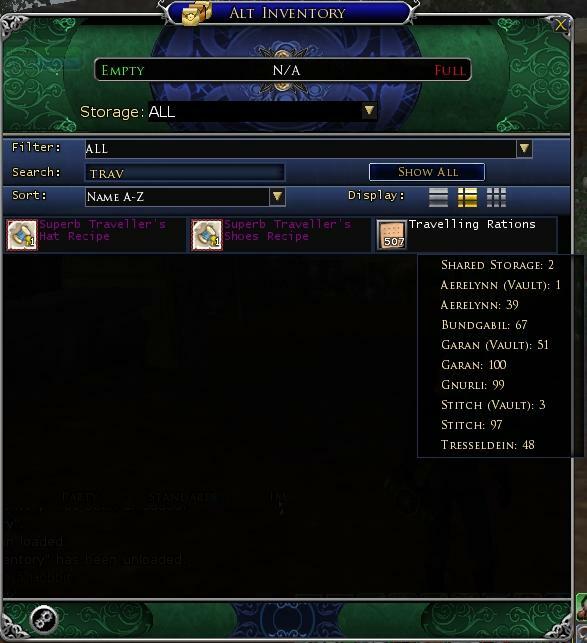 In an individual storage view (single character, vault or Shared Storage) the detail will show how many are in each container within that storage ("Chests" for vaults and Shared Storage and "Bags" for character). Tooltips will display when you hover over the icon of any item that your current character can access - if you open your vault, then any item in the vault will show a tooltip even after leaving the vault-keeper until you unload the plugin. Items with a grey and red dotted border will not display a tooltip. The mini-icon funtionality has not been implemented in version 3.0 but will return in a future version. Future plans: a long vacation in a warm climate. oh, for the plugin. um, well, not too many plans until we see what update 10 brings us. NOTE: I have cleared the version log since 3.0 is a significant code change from prior versions and the bugs/fixes from the prior versions are no longer relevant. The change log now starts with version 3.01. The "Version History.txt" however does cover all prior versions. Fixed bug reported by bsmorgan when refreshing vault for "ALL" characters. Ver 3.04 Implemented workaround for the bug introduce by U13 when suppressing the built in bags. Fixed bug when turning on "Current bags display total items" with current character selected and then adding an item to inventory reported by Bill Magill. Fixed bug when clicking Cancel in Options dialog reported by RJFerret. Re-implemented drag/drop for current items both into and out of AltInventory. Note, drag/drop will ONLY work when displaying the current character's bags. Added "Use Mini Icon" option. Changes the 32x32 square icon to a 16x16 round icon suitable for placement on the compass ring. Fixed a bug which sometimes prevented the Sort from being properly applied when adding an item (items were sometimes being added in incorrect positions). To install the Alt Inventory plugin, unzip the entire zip file to your Plugins folder. If you had the game running when you installed the plugin, you will have to type "/plugins refresh" or close and restart the game. To run the plugin, simply load it. Type "/plugins load altinventory" in your game chat window or set the plugin to load automatically from the Turbine Plugin Manager (type "/plugins manager" in chat or access from the System menu). When you first close the Alt Inventory window, the icon will appear in the lower left corner of your display, you can drag it to any location you want by holding Ctrl while you drag it and the next time it loads it will remember it's location. ...ings Online\Plugins\GaranStuff\AltInventory\Main.lua:331: Failed to import package "GaranStuff.AltInventory.ItemCategory". You can repeat it by yourself. 4) Try to Load plugin. When I translated this strings a year ago I didn't notice this error. UPD. Yeah. That's Right. I fixed it. I'll send you later new strings to add in plugin. Last edited by chirick86 : 04-14-2019 at 01:51 PM. That's what I thought. Thanks for the response. Is there a way to separate subscriptions in account for the shared storage? I have three subscriptions in one account, making it hard to separate info. I really enjoy your plugins. When you use the "ALL" button to show the inventory of all characters, it would be nice if it could show which character the item belongs to. Perhaps with color coding. Unfortunately, since the ALL view can show items that may exist on many if not all characters (I have some items like those pesky Dol Amroth tokens on nearly a dozen characters) having a unique color code per character would be impossible. Since there will be many items that have multiple quantities on multiple characters, your suggestion won't work. What the plugin does do though is provide a pop-up that lists which characters have any specific item, just hover over the item in ALL view and you will see a list of each character that has the item and their quantity. Note, there is also a pop-up list for the individual character and individual vault displays but if you have ever altered the bag layout (dragging inventory slots to another bag) the bag number will not be accurate (lua has no access to the actual bag slot so when Turbine allowed users to modify the number of slots per bag and to drag slots between bags it messed up the Lua API). I never bothered removing the bag number as it isn't used by many people and is still accurate if you don't move slots around. Last edited by Garan : 09-29-2018 at 08:44 PM. Alt Inventory is awesome! I can't imagine playing LOTRO without it! I have a desktop PC and a laptop PC, both running Windows 7, and I play LOTRO on both machines (not at the same time; one day I may be playing on the laptop, and another day I may be playing on the desktop). How can I keep the Alt Inventory data synced between the two machines? where accountName is your account name and serverName is the server name. You can ignore the data snapshot files as they only serve as data backups and are never used by the plugin. Last edited by Garan : 10-03-2017 at 07:57 AM. Last edited by Prairie Dog : 10-02-2017 at 10:16 PM. I've deleted and/or renamed several of my characters. Is there a way to forcefully remove them and their inventory from the plugin's list? Even a way to reset the plugin's list would be ok with me - I just can't seem to find a way to do either. Hi. To delete a character from the list, load the plugin, select the character you wish to delete. As long as you have not selected the character you are currently playing (you aren't allowed to delete yourself), a skull icon will appear to the right of the character selection list. When you click the skull it will display a confirmation dialog asking whether you wish to remove all of that character's data. The skull only displays for the character data, the related vault data is automatically removed when a character is removed. There is no way to rename a character in the list so you will need to delete the old data and then log back in to that character to initialize their new data. Don't forget to visit the vault-master and open your vault for any new/renamed characters. Last edited by Garan : 09-19-2016 at 06:55 AM. Equipped items are not listed unless removed to a bag. Short answer: Equipped items were displayed as a tab in Ver 1.x but were disabled due to a serious bug in Turbine's API that was causing client crashes. Long answer: It was such a pain disabling that panel and all the associated data and event handlers that I decided to remove all of the non-inventory functionality including Equipped Items completely and instead implement them as panels in a separate plugin, AltViewer, that was designed from the ground up to separate all of the functionality of its various panels to avoid this situation in the future. Unfortunately, it took Turbine so long to fix the underlying crash bug (two years) that I lost interest in the AltViewer plugin and stopped publishing updates. I kept it for private use for a while but eventually abandoned it altogether as I only play one character now and that only once every few months. In fact, the only reason I've logged in for the last year was to maintain MoorMap and TerrainMap (which is also why it took me so long to reply to this message). NOTE: THIS AND ALL OTHER INVENTORY PLUGINS ONLY HAVE ACCESS TO BAGS, EQUIPPED ITEMS, VAULT AND SHARED STORAGE CURRENTLY. Last edited by fade2gray : 05-17-2016 at 06:38 AM. Right, got it, but is that documented elsewhere as it doesn't appear to be in the plugin's description above? Good point. I'll have to look into adding a note about the required vault-keeper visit to initialize data to the plugin description. Have you visited the vault-keeper and opened the vault with each toon? Lua can only access the vault when you have actually talked to a vault-keeper and are still in range, any other time it is working from the snap-shot it makes while at the vault-keeper. The shared storage will be visible after the first toon opens it at the vault-keeper, but each individual vault has to be initialized by visiting the vault-keeper on each toon.